In honour of our most recent QVC kit we thought we would give you a few ideas on what to do with our new Strawberry Fudge mix! Now there’s the obvious one – Strawberries and Cream which is simple, yet effective and absolutely delicious. However, if you wanted to up your game then naturally the addition of a third flavour would be perfect. 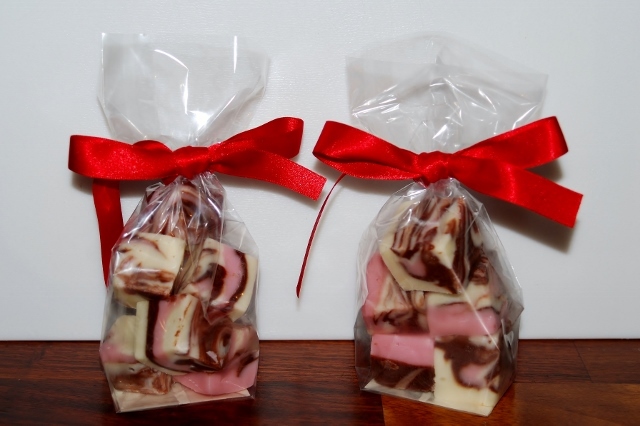 So, for a colourful change you can either swirl or layer chocolate, strawberry and vanilla fudge together for a delicious flavour fusion. 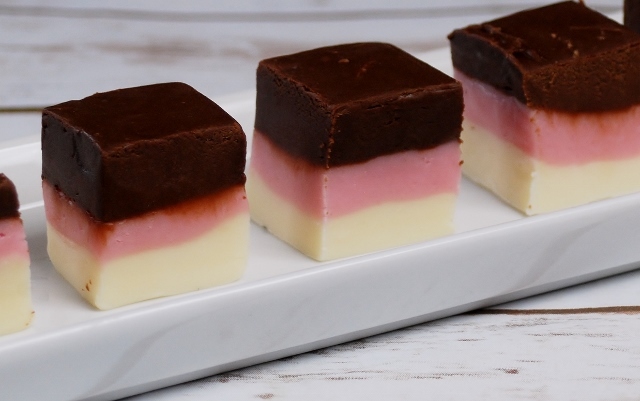 We can honestly say that it tastes like the Neapolitan ice creams of your childhood! We’ve found that people sometimes struggle to get an effective swirl as the fudge begins sometimes to set rather quickly, particularly when you have more than one flavour on the go so we’ll share a little secret with you…. If you make up your 3 flavours in separate bowls (2 trays will actually suffice for this but you can use 3 if you wish) you can then simply spoon your 3 flavours into the trays in random ‘blobs’ (for lack of a better word) as opposed to in layers. This means you have a nice distribution of colour within the tray of fudge even before you’ve started to swirl. Just make sure there is roughly an equal quantity of each flavour so that you end up with a nice balance. Once you have done this step, you can then put the whole tray back in the microwave for 10-20 seconds so that the whole tray of fudge is of a swirl-able consistency – don’t worry this is perfectly safe and saves you having to constantly juggle different flavours to make sure they’re all still runny enough to swirl. To complete your swirl, we find that dragging a cocktail stick (or the wrong end of a spoon) in small figures of 8 through the fudge creates a particularly pretty finished effect but feel free to use your imagination! We hope to see some pictures soon of how you’ve got on! For promotions, new flavours and top up mixes please see our online shop here!